Hirokazu Koreeda’s After Life (ワンダフルライフ) constantly calls into question the difference between reality and perception. From the point of view of the caseworkers, the viewer hears the memories of the recently deceased, and the caseworkers are tasked to create a short movie recreating said memories. However, the most important part of the recreation is not the authenticity of it compared to the memory, but the sensation the deceased feel when watching it. This theme of perceived reality being more important than the actual reality is not solely confined to just the recreation of memories, but it is applied to the camerawork and cinematography that create the movie itself. By affecting light, camera angles, and camera depth, the shots within the film give us an inside perspective on various characters’ perceptions of their own realities. While the physical image captured by the camera represents actuality, the lighting and camerawork serve to add a descriptive voice to the narrative that augments the depiction of what’s captured within the frame. Koreeda does an amazing job of allowing the viewer to perceive the feelings of the character he is currently shooting by attributing their feelings to the lighting and camera work that frames them. Shiori, who is loosely the movie’s protagonist is constantly shot in a way that reveals her inner state of mind. While her facial expressions and actions describe the actuality of her state, the cinematography works to add details that increase our understanding and perception of her. During the beginning of the movie, the boss of the caseworkers recounts how people can remember memories in the womb by submerging themselves in hot water with their eyes closed. 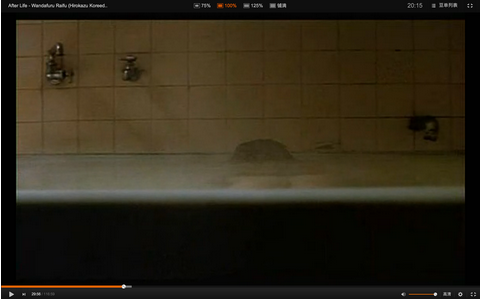 He says that the security and assuredness one receives by mimicking the womb state can help with anxiety and other conditions, and in the next shot we see Shiori almost fully submerged in a bath. Timothy Iles claims that: “Lighting helps the intimacy and delicacy of this scene: the lighting is soft, producing a pastel effect of Shiori’s face against the background wall, the gently rippling water of the bath, the tangible steam in the air. And yet what the camera is actually showing us is the bath of a ghost, a dead woman whom it presents as perfectly alive, possessed of emotions hopes and dreams and a future” (140.) However, Iles confuses what the camera shows us in congruence with the lighting, and what is actually being shown. If imagining the shot from a different angle with non-specific lighting we are able to remove ourselves from Koreeda’s intended shot and are able to construct our own scene bereft of his descriptive voice. In this newly reconstructed scene, we witness a girl who submerges herself in water in order to regain a pleasant memory of herself within her mothers womb. However, it is the darkness that consumes half of the frame and the ominous steam that surrounds a submerged head that depict a ghost rising from the dead. The blackness and the steam simulate the underground and hovering mist that are prevalent cinematically in graveyard scenes and serve to remind the viewer that even though Shiori looks alive and well, she still is and feels like a ghost. In one of the final scenes after Shiori’s love interest Arata decides to pass on to heaven, we can again witness Koreeda’s cinematographic choices echoing the feelings of Shiori’s frustration. While Shiori tramps through the snow kicking and disheveling as much snow as possible in her wake, the camera follows her in circles making up one of the longest continuous shots in the movie. The circular and monotonous movement combined with the considerable duration of the shot intimately display Shiori’s feeling of futility and discontent. The camera work gets more and more erratic in its shifts of focus as Shiori becomes angrier and climaxes with her fall. While she is on the ground, the camera mirrors Shiori by maintaining stationary until she gets up and starts to rebel again. The camera once again turns erratic, but it is noticeable that both the camera and Shiori have slowed down their speed. Without the camerawork the audience would still be able to decipher her frustration; but when it harmonizes with Shiori’s actions we feel Shiori’s bitterness and an everlasting feeling of futility. While Afterlife provides insight on characters feelings through its cinematography, it also provides a commentary on how characters perceive their life after death. The most noticeable and contrasting instances of these commentaries are displayed by Shiori and Iseya. Iseya who died at the age of 21 refuses to select a memory and go to heaven in order to atone for his sins in his previous life. Even though he is constantly encouraged by the caseworkers to pick a memory, he is absolute in his decision to spend an eternity in limbo without salvation. 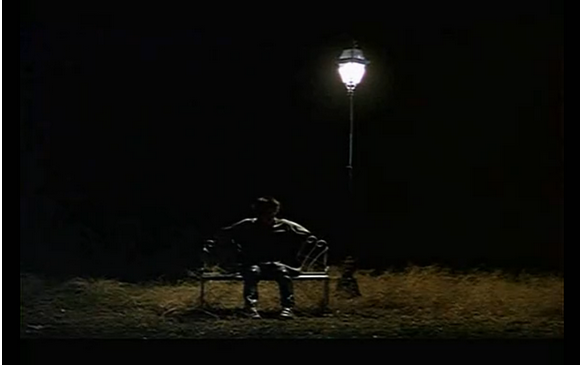 While not with his caseworker, Koreeda gives us 10 second shot of him sitting alone on a bench. The shot captures Iseya’s philosophy on how his life after death should be. Instead of sleeping in the bed provided for him, he forces himself into a life of austerity and aloneness. The muted light in the shot only serves to illuminate his loneliness and the opaque darkness that surrounds him. Like the punishment he desires for himself, the blackness that surrounds him also seems infinite. While his sniffling is indicative of his suffering in the cold night air, his refusal for salvation is successfully captured in the still and prolonged shot of his solitary. While Iseya believes that life after death should be a punishment, Shiori perceives her life after death as a continuation of her previous 18 years. Unlike with Iseya, the shots that depict her while she is out on the town aren’t stagnant, but incorporate a lot of movement with a handheld camera. Shiori passes through places that are bustling with people; to such an extent that the viewer wonders if we are actually viewing the caseworker limbo, or the normal human world. The camerawork is lithe, and as it follows Shiori through the crowded city its dodging and movement is humanlike. 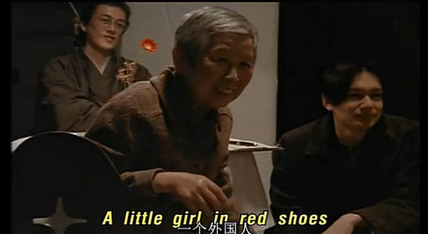 The cinematography in the scene is relatively active, which mirrors Shiori’s outlook on life after death. She dreams of falling in love with Arata, and she aspires to finish encyclopedias in her time in the afterlife. While she is the shots focus, the camerawork incorporates a significant amount of forward and lateral movement which is polar to the style of shooting used with Iseya. While his shots are isolated and still, Shiori’s shots adopt her whimsical and carefree nature by sometimes quickly panning up and down which reproduce for the viewer the sensation of stumbling. Instead of doing her job and taking useable pictures for the multiple cases, she aimlessly wanders around the city and takes pretty pictures with no useful value. Even during a relatively stationary long shot, we get to watch a contraption behind her unfold into something beautiful. While she occupies the images foreground, the transformation behind her is akin to a flowers bloom. The bloom is representative of her desire for growth, and even after death she still believes that there is much more to be enjoyed and experienced, while Iseya refuses to enjoy anything post mortem. When the caseworkers actually film the movies, Koreeda cinematographic choices make it clear that the perception of reality is more important than the actual reality itself. During the filming process the camera doesn’t focus much on the reenacted memory, but more on the expressions and responses the people have when watching their recreated memory. When the aviator supervises his memory recreation, we do not get a single shot of him in the airplane because the actual memory is not what is important. We do however, get multiple long shots tracking his face, and by observing his countenance we can see how he perceives the memory he relives. This same technique is used with the old lady who chooses a memory of her younger self dancing for her brother. Instead of the focus being on the girl who is dancing, the camera focuses on the woman watching the girl. While the girl’s dance is important to the woman, we solely care about the woman’s perception of that dance, which is the memory that she will ultimately take to heaven. The most apparent example of the movies fixation with perceived reality in lieu of actual reality happens in one of the final scenes, when Mochizuki watches his own send off movie. The movie starts with a medium distance shot of him sitting on a bench, and when he leans forward the camera also moves in to take a close up shot of his face. As his head slowly tilts upwards and locks eyes with the camera we get a 8 second shot of his face peering beyond the camera. 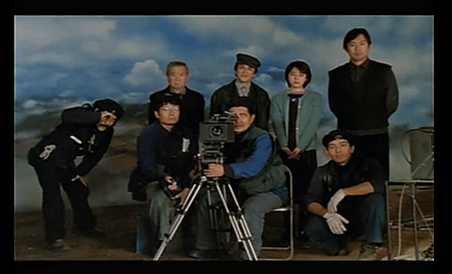 The camera then assumes the position of Mochizuki and we get a heartwarming shot of the crew filming him. If the caseworkers were actually filming him in this moment, they would not be so perfectly positioned, nor all be encapsulated so nicely within the shot. While his head is slumped he recounts the memory of his fiance, and then when he looks up into the camera, he sees the crew who he promises never to forget. Instead of the movie showing us what Mochizuki actually sees, we are privy to his perception of his fellow caseworkers who appear like a portrait with a backdrop instead of a crew currently filming. During the movie Mochizuki and Shiori at one point both look up within their office building and admire the moon that shines overhead. While they both know that the moon is fake, they stop to admire it because in that moment its beauty and allure are both real things that they’re perceiving. Shortly after this scene, Shoda shows up to Shiori’s room unexpectedly to talk about the moon and quickly gets rushed out. As he leaves we can hear him say “ちょっと難しかったかな” which in this context roughly translates to “I wonder if I was too confusing.” This short line hints at the importance of what Mochizuki says to Shiori, which turns out to be an allegory for the entire movie’s philosophy: “The moon is fascinating isn’t it. Its shape never changes, yet it looks different depending on the angle of the light.” It is our perception of reality that is more important than what is actually happening before our eyes; the moon will always be full, but from varying angles and we can all perceive the same thing differently.